It wasn't until I reached into my purse for my keys that I realized the cross was missing. I stood frozen for a moment then turned back to the bar. "Robert," I said, "Have you seen my cross pendant?" "Not since you took it out of your purse," he replied. Absola stared at me. "Cross missing?" she asked. I nodded. "This why cross WORN, not CARRIED," Absola said. Dang it. I walked back to the bar and looked around. There was no sign of the silver cross and chain. Robert came over, frowning. "You and Absola were the last customers. I bussed your plates and wiped the bar down after you were done," he said regretfully. I could see where the conversation was headed. "You think it could have been hidden under a napkin or something and ended up in the trash," I said. "Well, go look in can for refuse," Absola said to me. "I already took all the garbage out to the dumpster," Robert said. The three of us stood for a moment in silence. Presently Absola kicked off her shoes and reached into her purse. She took out a hair tie and pulled her hair back in a messy bun. "Come," she said solidly. "We search." When Absola talks like that there's nothing much you can do but follow her lead. We filed out the back door of Shank's. "Oh, ugh," I choked out. "It smells terrible out here." "I think it's all the warm weather," Robert said; "The smell's gotten worse in the last couple of weeks." "Is like rotting corpse," Absola said. I gritted my teeth. "Would you please stop the macabre talk for five minutes? I'm about to go dumpster diving and I don't think I can do it if you're talking about rotting corpses," I said sharply. "There aren't any bodies in the dumpster, I promise. The garbage was collected this morning. When I brought the bags out tonight I saw that the dumpster was empty," Robert said. He placed the palms of his hands on the lip of the dumpster and swung up and over with an easy grace. "I'll look," he said; "I know which bag it's likely to be in." I shook my head and said, "It's not your problem; it's mine. I shouldn't have been so careless with the cross in the first place. Charlotte would be crushed if she knew about this." I kicked off my pumps and approached the dumpster. 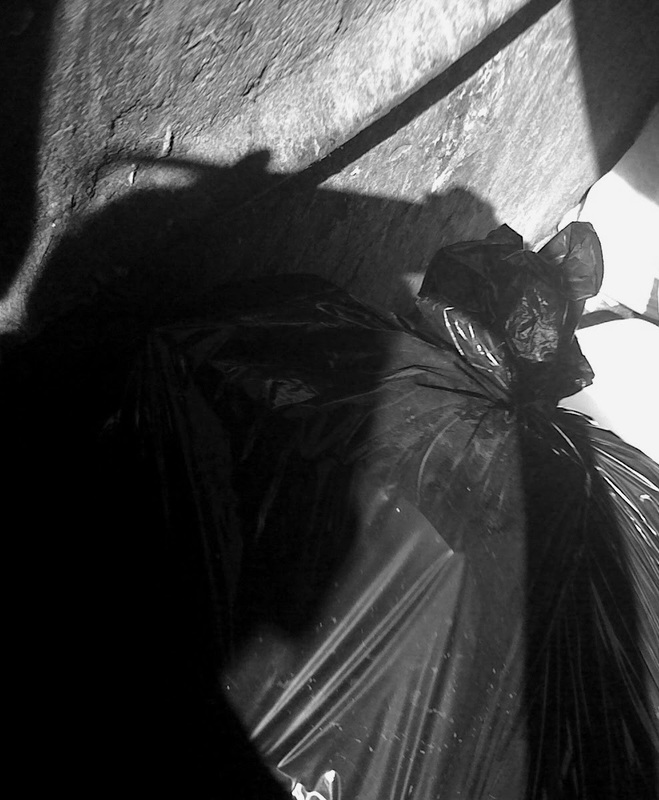 The stench in the alley was crushing, but there was a light beaming directly down on the dumpster. I hoped that light would speed up the search. "Would be easier if take off little jacket," Absola said to me. "No, I'll keep it on." I clambered up the front of the dumpster. "Thanks," I said to Robert as he helped me in; "Now, what are we up against?" "I'm pretty sure it's that one," Robert said, pointing to a bag of garbage. He grabbed the bag and ripped open the top. I peered over his shoulder at the mass of discarded napkins and bits of food. I sighed. "Hand it over," I said. Robert smiled sympathetically and said, "Hopefully you won't have to look far. Like I said, you two were the last customers. Your garbage should be at the top." "But the cross could have slipped down further in the bag. It's heavier than napkins," I said. Poking at the top layer of garbage uncovered a fried crust of bread. It could have been the remains of my Monte Cristo sandwich. "Wait a minute," I said hopefully. I gingerly sifted the garbage around the fried bread with my fingers. Tiny metal chain links slipped over my fingertips. I closed my fingers around the metal and pulled my hands out of the garbage. "I found it," I said excitedly, holding the cross high in the air. "Wonderful. Now put on," Absola commanded. "No way. Not until it's had a good cleaning," I said. Robert laughed appreciatively. "All's well that ends well," he said. I smiled at him. "Thanks for your help, Robert. My best friend gave me this cross as a high school graduation gift. It means a lot to me," I said. "That would be Charlotte, right? She and her brother were here tonight having dinner with R.J."
"That's right. Charlotte Hawthorne. Do you know her?" "I've seen her around campus," Robert said with a shrug. He glanced away. Ah, yet another man who's fallen prey to Charlotte's effortless charms. "Yes, she's hard to miss," I said with a laugh. "I could introduce you to her." "Don't bother," Robert said. "There's already enough guys circling around her. I'm no moth." He swung out of the dumpster and dropped to the other side. "Sit on the edge and I'll help you down," I heard him say. I pulled myself up and swung my legs awkwardly over the edge. "Remind me the next time we go dumpster diving to wear something more appropriate than a skin tight dress," I said glibly. "Would be easier without jacket," Absola murmured. I aimed my hands for Robert's shoulders and half jumped, half fell from the dumpster. Robert caught me and lowered me gently to the ground. "How about we all just avoid dumpster diving in the future," Robert suggested. "Agreed," I said. I reached down and grabbed my shoes, eager to escape the alley stench. But when I grabbed the shoes I lost my grip on the chain and cross. And of course the cross couldn't just land at my feet. No, that would be too easy. It actually flew out of hand and under a discarded pallet next to the dumpster. Robert and Absola saw the entire thing. "Are you kidding me," Robert said. Absola covered her eyes with her hand. "I saw where it went," I said quickly. I put on my shoes and walked over to the pallet. There was the cross, shining in the moonlight. "Found it," I called out. I picked up the cross and was straightening up when something caught my eye. It was sticking out from behind the dumpster and it looked like...a hand. I stepped onto the pallet and knelt down for a closer look. It took several tries before I could speak. When my voice returned I said, "Robert, could you get a flashlight and shine it behind the dumpster? I think I found the source of the smell in the alley." The flashlight's beam shone on the horrible truth. We'd found the missing hostess, Andrea. The Monte Cristo isn't sitting well in my stomach now.